Fashion designer Henrik Vibskov’s Surprise Mistakes workshop at Domaine de Boisbuchet saw participants experimenting with shapes, textures and materials, culminating in a performance piece. 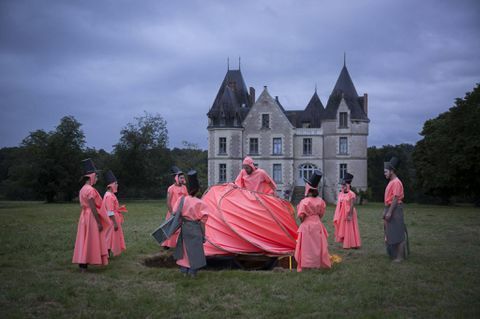 Every summer in southwestern France, along the edge of the river Vienne near Poitiers, an eclectic group of creative professionals and students gather to flex their artistic muscles. Since 1996 they have crafted dishes using South African mopane worms, built structures held aloft by colourful, helium-filled balloons and experimented with materials and forms to stage otherworldly performance pieces. This is the dreamy world of Domaine de Boisbuchet, an architectural park and playground created by Alexander von Vegesack and Mathias Schwartz-Clauss, the former founding director and senior curator at the Vitra Design Museum in Weil am Rhein, Germany. Every year from June to September, Boisbuchet hosts workshops run by a rotating cast of internationally renowned and emerging designers. Last year Botswanan craftsman and entrepreneur Peter Mabeo and ETH Zurich's Block Research Group hosted workshops and Danish fashion designer Henrik Vibskov was a 2016 tutor. It all comes to pass in a pastoral setting encompassing hectares of hills, valleys, forests, lakes and a 19th-century manor house that's "actually a chateaulette," says Schwartz-Clauss. "Which is architecturally completely uninteresting, but situated in a remarkable way in the landscape." Participants stay in a mix of private and shared dormitory rooms. Other structures, by the likes of Shigeru Ban and Brückner & Brückner Architekten, join the chateau to comprise the architectural park and provide venues for theatrics and exhibitions showcasing the outcomes of the workshops. "It was kind of mystical," says Montrealer Marine Lastere, who spent four months at Boisbuchet in 2017 with her partner, industrial designer Benoit Lachapelle, first volunteering then participating in several workshops. "For outside people, it sounds almost like a design cult," says Lachapelle, though he's quick to point out Boisbuchet's practical value and not just for professionals. Workshops touch on product design, interiors, architecture, engineering, fashion and food. "And then some rather unusual – at times, even crazy – stuff like hairdressing or choreography," says Schwartz-Clauss. Each year has an organizing theme and 2018 promises a focus on the fake and real. "It is a bit inspired, I must confess, by Donald Trump and fake news," says Schwartz-Clauss. This year's roster of workshop leaders includes Achim Menges, a researcher in computational design, Stephanie Chaltiel, who creates robotic clay architecture, and Canadian product designer Philippe Malouin. "Boisbuchet has no neighbours," says Clauss-Schwartz. "You have a full view of the Milky Way. You hear all the forest animals at night. We are in the middle of nature, which is a fantastic environment for getting inspired, but also for connecting with participants and tutors, who are living closely together for a full week of shared life and work." For more information on 2018 workshops and rates, visit boisbuchet.org.